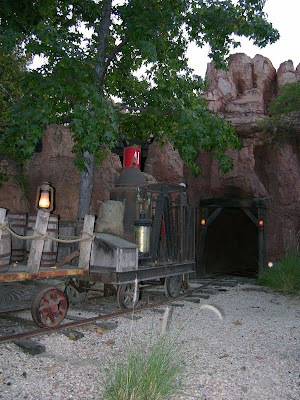 Thunder Mesa Mining Co. #1, the Marc F. Davis. This tiny locomotive is named in honor of renowned Disney Imagineer Marc Davis. It was scratch-built on a Bachmann cable car power truck using mostly old parts from the scrap box. It was the mid-1860's when old Badwater Baxter first discovered gold near the headwaters of Big Thunder Creek. That was years before the railroad came, and back in those days, the raw ore was hauled down from the mines by mule pack. The trail through Rainbow Desert was long and filled with many dangers, but eventually wound its way to Fowler's Landing on the Big River. From there, the Western River Expedition Company would take the ore down river by boat to the smelters and markets to the south and west. Pack Mules in the Rainbow Desert. Image courtesy Gorilla's Don't Blog. Marc F. Davis was the founder of Western River Expeditions and his keelboats and stream launches were manned by some of the most colorful characters in the West. Heck, one legend says he even trained a bear named Ted to row! 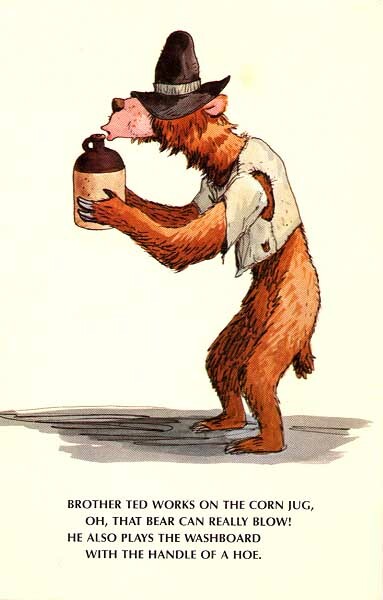 Truth is, the bear was more of a musician and also played the washboard with the handle of a hoe... Now, where was I? 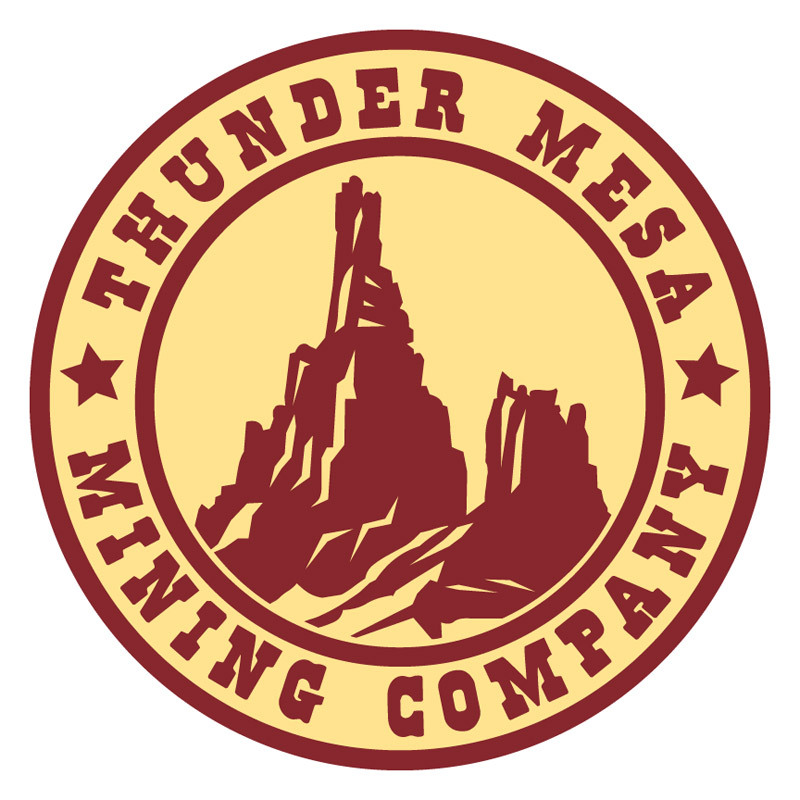 Well, there are many tall tales and legends to from those early days in Thunder Mesa country, but this is the story of Thunder Mesa #1. 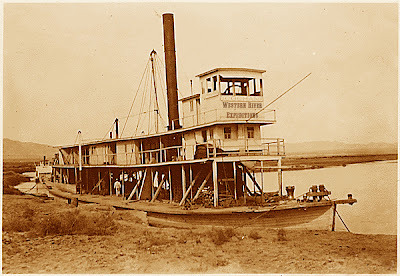 A rare, undated photo of one of the Western River Expedition Company's larger steamers. It was the spring of 1878 and floodwaters were high on the Big River. Santa Fe, Denver & Carolwood track gangs were working overtime, laying a new branch line to Thunder Mesa, while a second crew blasted tunnels and built bridges to bring the line down from the Calico mining districts. The TMMC's first locomotive, a handsome 2-4-0 called El Dorado had yet to arrive overland from San Francisco. Deep snows in the mountains and the raging river led to delay upon delay. At long last, word arrived that El Dorado was on its way up river by steam launch, still in crates, to be assembled at the SFD & C shops at Grizzly Flats. But the spring flood was too much for the Western River Expedition's overloaded steamer, the Wicked Wench. It foundered in a whirlpool at Deadman's Rapid where all hands, and the El Dorado were lost. Not to be. The fancy, brass banded El Dorado went down in pieces at Deadman's Rapid. Only a few parts were ever recovered. As one might imagine, this was a huge setback for both the railroad and the Western River Expedition Co. The rail on the mining line was too light, and the curves too tight for the heavier SFD & C locomotives. It was clear that a new, small mining locomotive would be needed to finish the line and it would take time and no small expense to ship another from San Francisco. Every day without trains running was a loss in revenue for the line's investors and the telegraph lines were ablaze with accusations and recriminations. 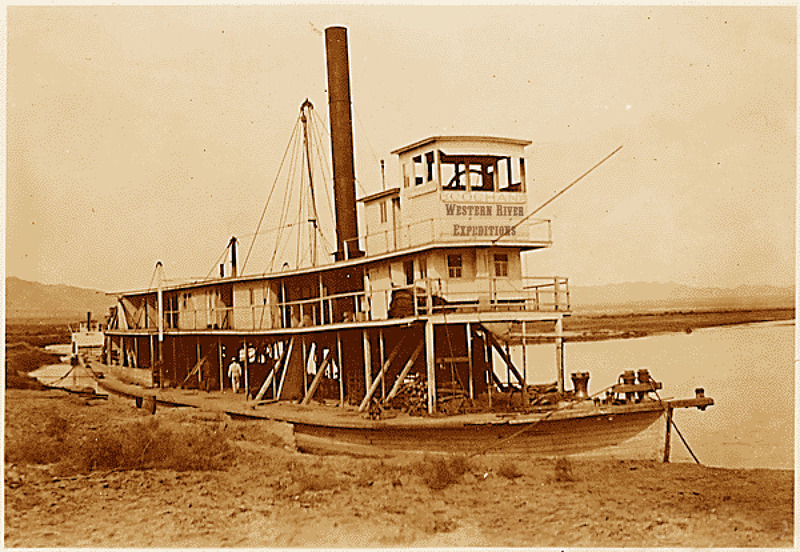 The Western River Expedition Company was forced into bankruptcy over the affair and Marc F. Davis was nearly ruined. Then, when all seemed lost, a brilliant young blacksmith named Roger Broggie said that he could "put together" a serviceable locomotive from the wreckage of the steam launch and bits and pieces of the El Dorado that had been salvaged from the river. Davis gladly donated the wreck to help mitigate his losses and Broggie got down to work. As it turns out, the blacksmith was something of a mechanical genius, and the tiny 4 wheel locomotive he created helped get the fledgling mining railroad back on schedule. It was ungainly, smokey, and loud, but, by thunder, it ran! The home-built locomotive that helped build the railroad, Thunder Mesa #1. 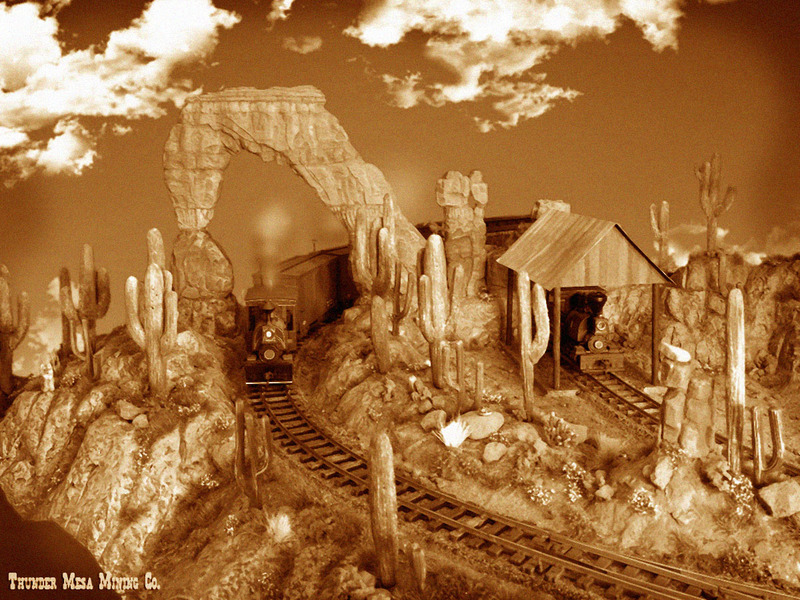 A little over a year later, the line from Thunder Mesa to Calico was completed and the first ore trains began to roll. In a rare display of magnanimity, the railroad brass decided to name the little locomotive that helped build the railroad the Marc F. Davis. History does not record wether Davis was honored or chagrinned by the gesture. The real Marc Fraser Davis working on a model for the never built "Western River Expedition." It was to be a Pirate's of the Caribbean style boat ride through the Wild West featuring many scenes filled with his trademark humor. As part of the larger Thunder Mesa complex planned for Orlando, some of the ideas survived to be used on Big Thunder Mountain Railroad. 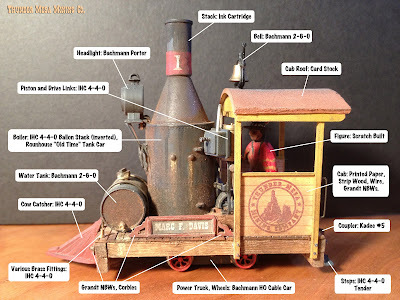 My 1/4" scale Marc F. Davis is a tiny locomotive with no known prototype. It shares certain characteristics with some early vertical boiler Climax and Shay type locomotives, but its main inspiration comes from the two walking-beam locomotives seen as set pieces at Big Thunder Mountain in Anaheim. Inspiration for the Marc F. Davis, this tiny mine locomotive at Disneyland. Fun trivia note, these two engines were featured in the 1978 Disney film Hot Lead and Cold Feet starring Jim Dale, Karen Valentine and Don Knotts. My model began with the itch to build something and a day spent "cleaning out" my scrap boxes. Let me tell you, after thirty-plus years in this hobby working in multiple scales, you get a pretty serious collection of unfinished models, incomplete kits and left over parts. HO and On30 share the same track gauge, which is one of the things that makes On30 so appealing to us kit-bashers. It's easy to use readily available HO scale mechanisms, wheels and other parts as the starting point for a myriad of On30 projects. This project started with an HO scale Bachmann cable car power truck. Just five scale feet long on O scale! I pulled it out of the scrap box, set it on the track, cranked up the juice and, lo and behold, it ran! Sort of. After cleaning the wheels and contacts and treating everything with a liberal dose of CRC 2-26 it ran like a top. Electrical pick-up problems? Not any more! If you model a lot of small, short wheel-base equipment like I do, this stuff is your best friend. Use it on wheels and track. Now I knew I had the perfect power truck to build one of those tiny vertical boiler steamers I'd been dreaming of. Power would be DC only due to the motor being grounded in a metal frame, but since the TMMC is wired for both DC and DCC operation I knew that wouldn't be a problem. Follow along with the pictures and captions to see how it all went together. An Acurail HO boxcar frame was cut apart, reassembled, painted Grimy Black and then framed with scale 6"x8" strip wood. This gave a sturdy frame with coupler pockets to receive Kadee #5s. A deck was created with some 3/32" scribed siding and clearances were tested on the layout. The entire locomotive is a press-fit on top of the power truck and can be removed if necessary. The vertical boiler was made from various scrap box finds including an HO Roundhouse tank car and the inverted balloon stack from an HO IHC 4-4-0. The smokestack is a technical pen ink cartridge. Here's the partially completed engine. I had no plan and just basically made things up as I went along. In this view can be seen the steam chest, single vertical piston and rod linkage that "drive" the locomotive via a theoretical cam and gear arrangement below decks. With the exception of some bits of wire, all of the drive line parts came from an HO IHC 4-4-0. The Marc F. Davis ready for service. I weathered the model with acrylic paint and colored chalks to depict years of heavy use (and abuse). 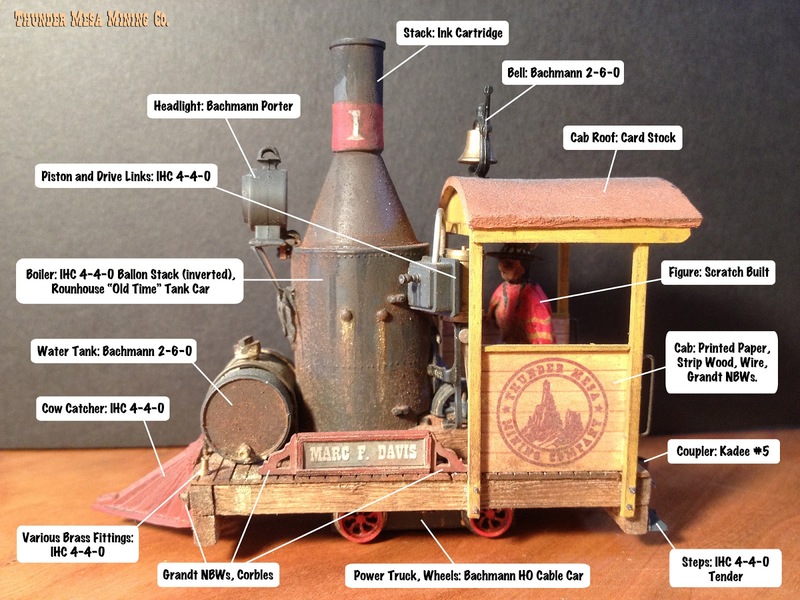 The cab was built using printed photo textures of actual weathered wood with the Thunder Mesa herald added. Click the photo to see a large version with all of the various parts called out. Building the Marc F. Davis was a lot of fun, especially since it cost me next to nothing using mostly old parts from the scrap box. I built it primarily as a scenic piece, something to sit on a siding and look cool, so the fact that it actually runs and can pull a couple of ore cars is just a bonus in my book. Coming up with an elaborate backstory for the engine was almost as much fun as actually building it. 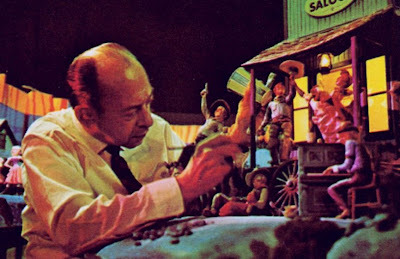 Many thanks to the real Marc Davis for the years of enjoyment he has provided for myself and my family, both at the movie theater and in the parks. 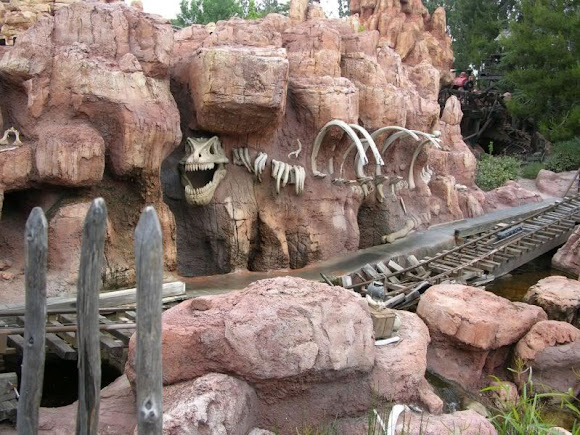 Now here's a short YouTube video of the One Spot in action on Thunder Mesa. Hope you enjoyed the story of #1 and thanks for stopping in. Adios 'till next time! #1, rounding the bend on the Thunder Mesa Line. Engine #1, the Marc F. Davis, hauls another load of Leaverite through Dinosaur Gap on a hot, sunny afternoon. Sky and smoke effects by Photoshop, all else as modeled. There will be more on the story of Engine #1 in a future post. "Ya know, I hear tell a long time ago Dinosaurs roamed this area. 'Course all ya find now is cactus, snakes and coyotes... And sometimes the sun-bleached bones of an ancient animal." So spoke Dal McKennon during the recorded spiel on the old Mine Train Thru Nature's Wonderland at Disneyland, describing the scene as the little yellow trains passed by a fossilized T-Rex in the Living Desert. Later, when the Big Thunder Mountain Railroad replaced Nature's Wonderland, the idea of a fossilized dinosaur was carried over and imbedded in the rock as part of the exciting climax of the attraction. Since both the Living Desert and Big Thunder Mountain prominently featured a dinosaur skeleton, I knew I just had to include a scene like that in my story of Thunder Mesa. Dinosaur Gap on the Thunder Mesa Line. The bones came from the local toy department. Dinosaur Gap is a major scene on my small railroad, one that I've been planning on from the very beginning. I had put off tackling it for a long time since I wasn't sure exactly how I would make the bones. Finally, I had a serendipitous moment when I saw the perfect item while shopping with my son at the toy store. There was an educational kit for building a Tyrannosaurus Rex from the bones up. It was a little more than I wanted to pay but it was just the right size. I bit the bullet and brought one home. Now I had no excuse for not finishing the scene. Once I got Rex home, I picked out the parts I wanted to use from the kit and went to work. I wanted a more naturalistic position for the fossil than what is seen on Big Thunder, and I wanted it to look as if the natural weathering and erosion had only recently exposed the bones from their sixty five million year old hiding place. Testing the fit. I had to "break" a few bones to get everything where I wanted it. 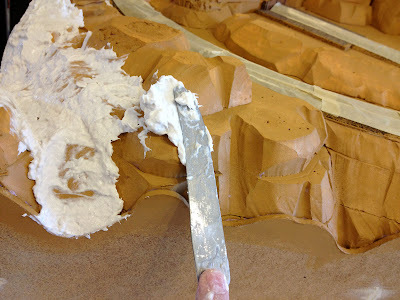 Carving away a little of the existing scenery. A bed of fresh Sculptamold for the bones to rest in. The mixture had to be pretty stiff to stay where I wanted it. The bones were then pushed into the wet Sculptamold and a clay modeling tool was used to work the paste up around them and sculpt the rock. While waiting for the Sculptamold to set up, I decided to go ahead and ballast all of the track in the scene. I had already painted the track awhile back using Floquil paint pens, mostly Rail Brown for the the ties and Rust for the rails (with a few ties dry-brushed with unbleached titanium here and there for a little variety). Yet, I always seem to put ballasting off for some reason. It must have something to do with a traumatic N scale experience long ago. Anyway, ballasting in On30 is a lot easier given the size of things. I used Chick Grit from the local feed store for my ballast. It's just the right size and has a nice, uneven texture compared to most commercial model railroad ballast. The only problem is that it is a white granite and I wanted a ballast with more the look of buff limestone. My solution was to die the ballast with diluted acrylic paint. Pouring some Purina Chick Grit into a soupy mixture of raw sienna acrylic paint. The paint has to be diluted by just the right amount for this to work; too thick and the grit will all glue together, too thin and the color won't take. No, I have no idea what ratio I used. I eyeballed it as usual. After soaking in the paint for two days, I strained the grit through an old t-shirt and let it dry in the sun. The result was a nice, varied buff color ballast. The ballast was applied in the usual way, spread out with a soft brush, wetted down with "wet" water and held in place with diluted matte medium (1:1). 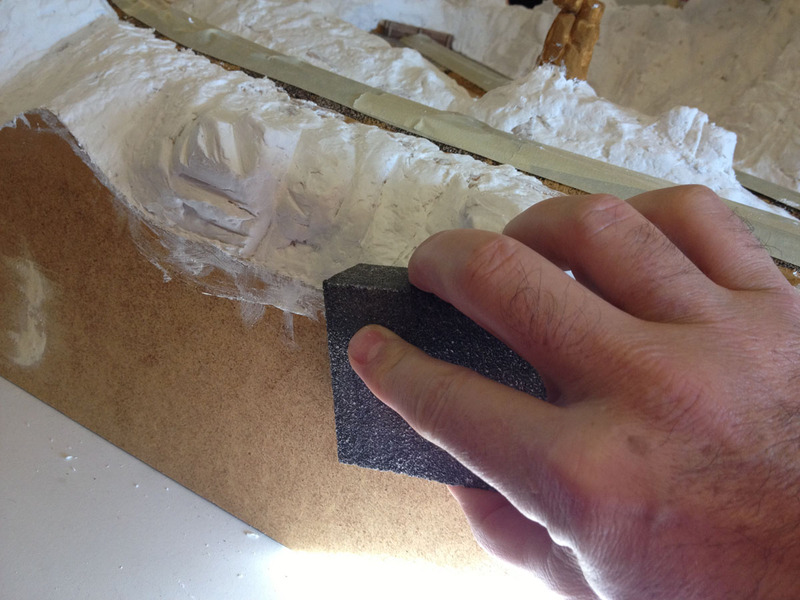 The masking tape is a dam to keep the ballast in place on the steep slope while the glue dries. Both the ballast and the Sculptamold were allowed to dry for a couple of days and then it was time for the final paint job. The bones and the rocks were finished using my usual colors and methods. The bones, technically, are rock, fossils that is, and I didn't want them to stand out too much or look garish. First, a coat of the scenic base color, Glidden "French Mustard." A wash of diluted India ink. The final paint job - using mostly raw sienna, burnt umber and unbleached (buff) titanium acrylics, dry-brushed on with a light touch. Once the paint job was done it was time to bring some life to the Living Desert with plants, rocks and ground cover. 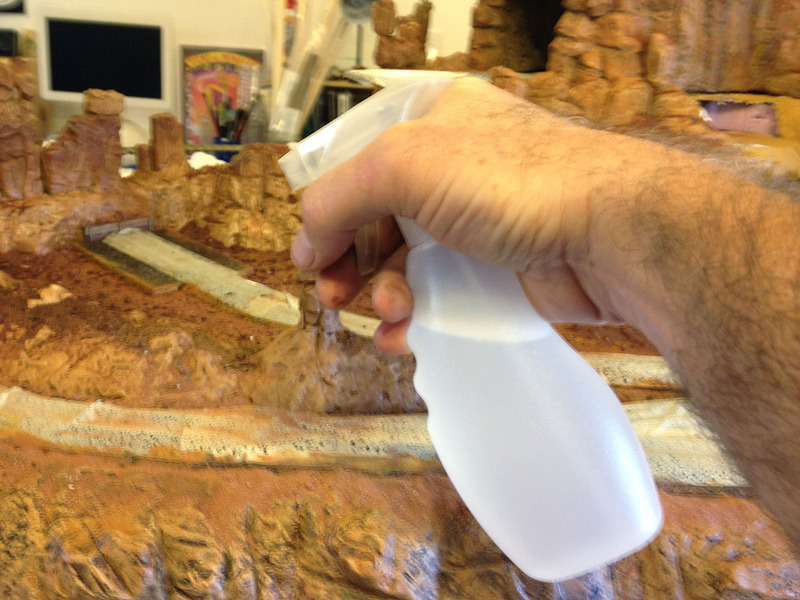 One of the keys to good model scenery, I believe, is a variety of textures. 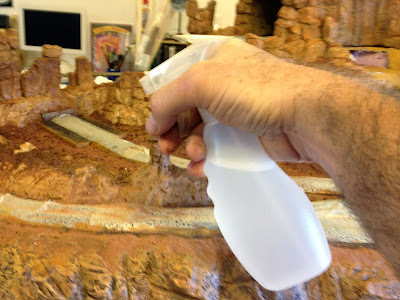 With that in mind I use a mix of commercial products, scratch built trees and cacti, sticks from the yard and real dirt and rocks from nearby Sedona, AZ. Some of the scenic elements here include rocks and red dirt from Sedona, hand-built balsa cacti, Silflor grass tufts and flowers, Woodland Scenics Course Turf and Field Grass, dead branches from our rose bush, and some excellent prickly-pear cactus castings from Pegasus Hobbies. Overall view of the finished scene. The scraggly juniper trees are made with rose bush twigs and Woodland Scenics Dark Green Foliage. Okay! That should do it for this update. Next time I'll tell the detailed story of Engine #1. Thanks for checking in. Adios for now! Here's a two minute video of the sound equipped Bachmann On30 pulling a short mixed train through the scenery of Thunder Mesa. Love the sound of the loco echoing down the "canyon" and the slow speed is great. Definitely not a roller coaster! Every little short-line railroad needs a herald, right? 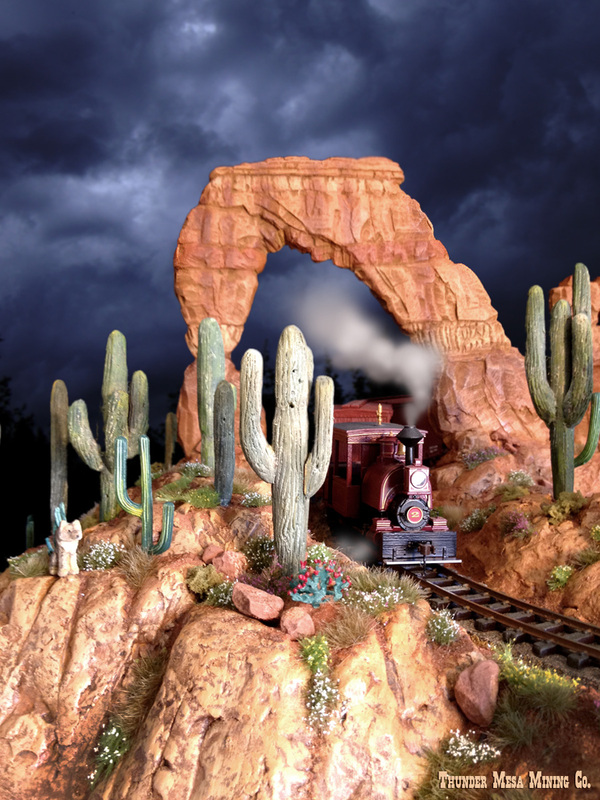 Here's one I cobbled together for the Thunder Mesa Line. The central butte image is from a font set called Big Thunder Dingbats. It was designed by David Occhino and is available as a free download from his site. The lettering was done by me in Adobe Illustrator. I'll be having some custom decals made in the future, but for now, here's a little Photoshop magic showing how the new herald will look on some Bachmann 18' boxcars. Under threatening skies, a daily mixed train passes beneath McKennon Arch. 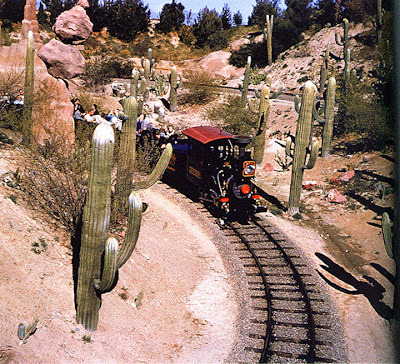 Porter #2 chugs through the Cactus Forest on its way to Thunder Mesa as a wily coyote looks on. Sky and smoke effects added in Photoshop, all else as modeled. 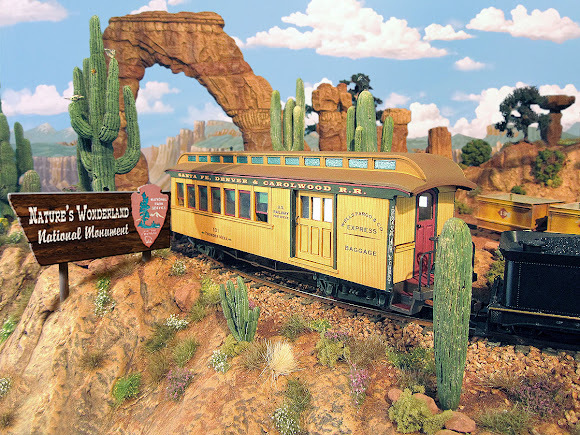 The latest section of scenery to be completed on the TMMC is a large swath of the Living Desert that includes the Cactus Forest and majestic McKennon Arch. The arch is named for the late Dallas McKennon, beloved character actor and voice of both the Big Thunder Mountain Railroad and its Disneyland predecessor, the Mine Train Thru Nature's Wonderland. Cactus Forest on the original Disneyland Mine Train. Many of the cacti assumed human and humorous shapes on the attraction, including the Seven Dwarves. I decided to go a little more naturalistic on my version. Photo © Disney. 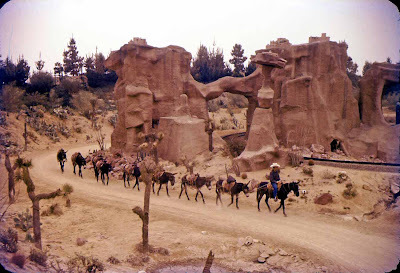 The Cactus Forest was an area of the Living Desert on the old Nature's Wonderland attraction that was not carried over when Big Thunder was created. Nevertheless, I have many fond memories of the old Mine Train ride and wanted to include a version of the Cactus Forest on my Thunder Mesa Line. McKennon Arch is part of a ridge that forms a scenic divider on the layout, visually separating the Geyser Gulch scene from the Cactus Forest and engine service area. I knew I wanted to finish this ridge and blend it in with Baxter's Butte before I tackled the Cactus Forest. This is just a quick "what I did," for a complete "how I did it" rock tutorial, please see my Rock Work 101 series. Nothing to see here, just some painted polystyrene foam. Things will be getting messy from here so I protected the track with masking tape. Slathering on some Sculptamold with my preferred sculpting tool, a butter knife. Letting the Sculptamold dry after it has been shaped and blended with the Balsa Foam carvings. Sanding excess Sculptamold off of the profile board once it has dried. Scenery painted with my standard base color. Darkened with a spray of diluted India Ink. Once the rock work and scenery base was painted and allowed to dry it was time to add the ground cover and details. Once again I used real dirt and rocks collected in Sedona, AZ and near Moab, UT. For the greenery, I used a variety of products from Woodland Scenics and Scenic Express, plus my own, scratch built saguaro cacti. I made about fifteen cacti, using John Olson's tried and true method of carving them from balsa wood. These large cacti were intermixed with some smaller castings from Woodland Scenics. Small bushes are Woodland Scenics Extra Course Turf, and the clumps of grass and flowering plants are Silflor Tufts from Scenic Express. Sprinkling on real dirt and small rocks. Wetting everything down with a spray of "wet" water: water with a few drops of liquid detergent added to break the surface tension. Flooding everything with a generous amount of white glue diluted 1:1 with water. Diluted matte medium also works. Gluing down larger rocks and boulders. After all the rocks and dirt have been added. I construct all of my cacti and trees with a small nail sticking out the bottom for planting. When everything is still wet, it's easy to push them right into the base. A dab of full strength white glue holds it in place. 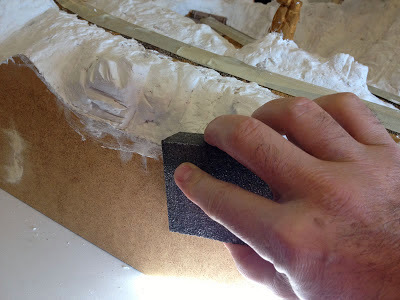 Adding a Silflor Tuft to a dab of white glue. These tufts are an excellent product from Scenic Express and can produce very realistic looking scenery. I highly recommend them. There are always flowers in bloom at Disneyland, so when it came time to decide on a season for Thunder Mesa there was never any question that it would be springtime to early summer. The Sonoran Desert in bloom can be an astoundingly beautiful place and I wanted to capture some of that on the layout. The flowers are "Early Spring" and "Late Spring" wildflower tufts from Silflor. The Living Desert will be full of wildlife and here are a just few that have found homes there so far. This curious raven sits atop a cactus. He's made from acrylic modeling paste over a wire armature. The coyote or desert wolf, carved from balsa wood. And what would paradise be without a few serpents? This diamondback rattlesnake is a painted bit of solid core copper wire. Track through the Cactus Forest has been painted but still needs to be detailed with ballast and weeds. I'm waiting on some Woodland Scenics medium buff ballast via mail order. Trackside view of the completed area. I still need to balast the track and build a tailings trestle for the high-line track at right. As for the next major scenery project, I'll probably finish Geyser Gulch next, then it's on to Big Thunder Creek and the rest of the town area. Stay Tuned!